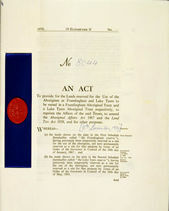 This document changed Victoria’s law as the first Act to recognise Aboriginal people’s entitlement to land in the State. Under this Act the deeds of reserve land at Lake Tyers and Framlingham were transferred to the communities under Trusts established for this purpose. This Act took the recognition of Indigenous rights a step further than the Aborigines Act 1910, in providing the legal basis for Aboriginal people to hold the title to land where they lived. The long history of Aboriginal people’s claim for equality before the law of the State was an erratic path, marked by failure more often than success. In 1938 Aboriginal people in several parts of Australia marked the 150th anniversary of British settlement as a 'Day of Mourning'. Also in 1938, Aboriginal activist William Cooper (who founded the Australian Aborigines League) tried to get the Commonwealth government to forward a petition to King George VI. Though unsuccessful, from that time campaigns to remove inequalities were more systematic and widely based, with the focus on the need for Commonwealth action on behalf of Indigenous people throughout Australia. Each State had its own laws and policies about Aboriginal people, as the Commonwealth Constitution preserved this power for State governments. This meant that Aboriginal rights depended on the State boundaries, rather than the justice of their cause. In 1955 the Victorian government appointed a retired magistrate, Charles McLean, to inquire into the circumstances of Aboriginal Victorians. McLean was critical of conditions at the two remaining reserves, Lake Tyers and Framlingham, but returned to the spirit of the Aboriginal Protection Act 1886. He suggested that Indigenous Victorians of mixed descent should be removed and assimilated, thereby reducing the populations of the reserves. McLean’s report provided the basis of the Aborigines Act of 1957, which also created a new Aborigines Welfare Board. The people at Lake Tyers resisted all attempts to close their community under this law, and one result of their campaign was the formation of the Victorian Aborigines Advancement League. The League employed a full-time officer. The first person in this job was Doug Nicholls who, in 1976, became the first Aboriginal person to be appointed a State Governor, in South Australia. The campaigns of the people for community control at Lake Tyers and the work of the League were eventually successful. In 1971, this Act granted the 4000-acre reserve to about 40 members of the community under communal freehold title. The Framlingham community also received communal title to 500 acres under the Act. Broome, Richard, 'Victoria' in Ann Mcgrath (ed. ), Contested Ground: Australian Aborigines Under the British Crown, Allen and Unwin, St Leonards, 1995.